Gorgeous festival 2013 is only 9 days away! 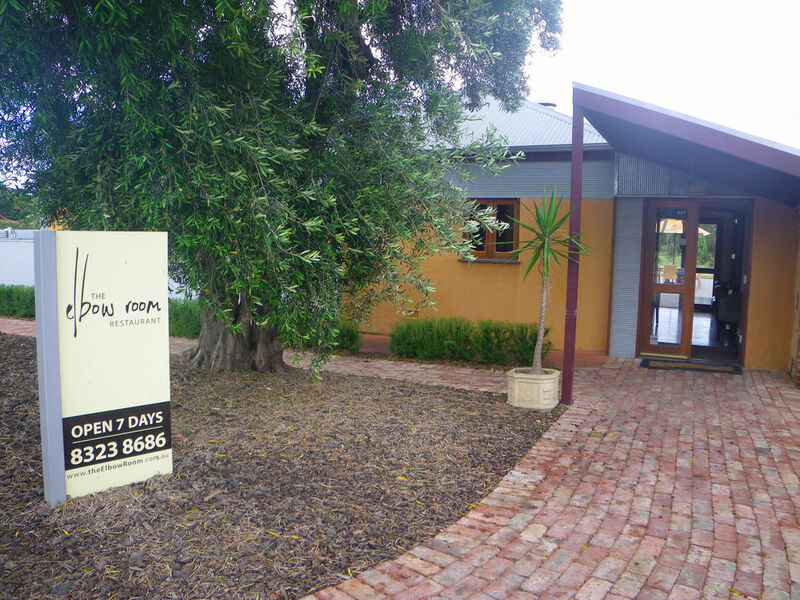 As discussed in the previous post, the festival this year will be held at the Serafino Winery in McLaren Vale. Tina and I were invited as guests, along with Lamb’s Ears and Honey, to preview the food and dishes that are to be offered at this year’s event. Previously, I’ve talked about Home Grain Bakery Pies and Salopian Inn. 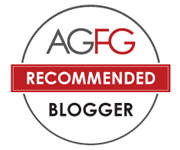 In this post, two formal dining restaurants, Ampika’s Kitchen and The Elbow Room, are featured. If went by myself, I would have definitely missed out the Ampika’s kitchen. 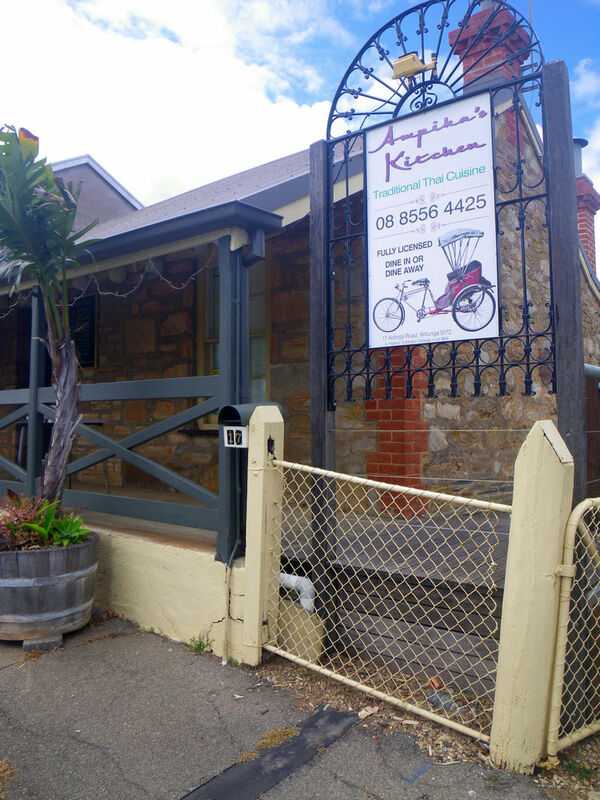 Located on Aldinga Road, the restaurant offers authentic Thai cuisine. In fact from the front door, one can easily omit it, but once you’ve tried their dishes, you will remember life long. Thanks to the lovely owners who opened their door for us on a non business day. The decorations inside the restaurant are very much Thailand themed and with a Buddha and other cultural items, it made me feeling somewhere in Thailand. 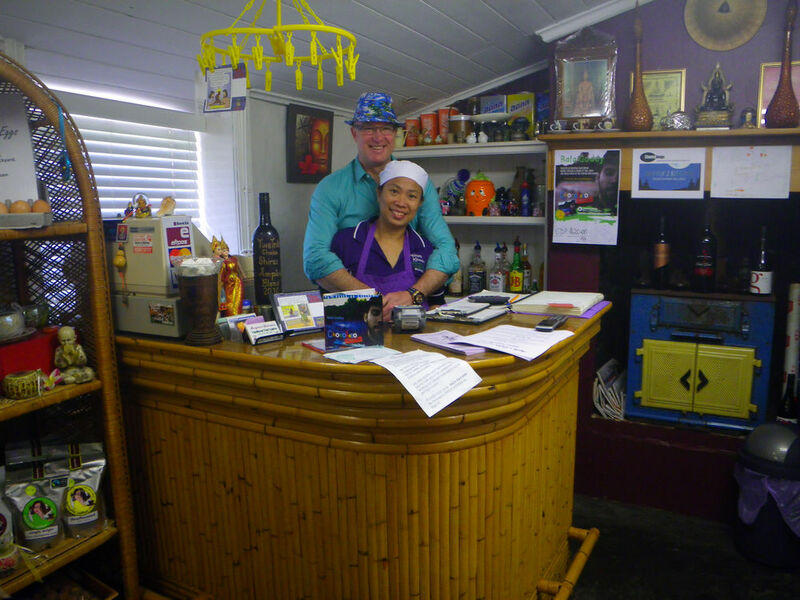 In fact, I would have never thought there could be a good Thai restaurant in McLaren Vale. 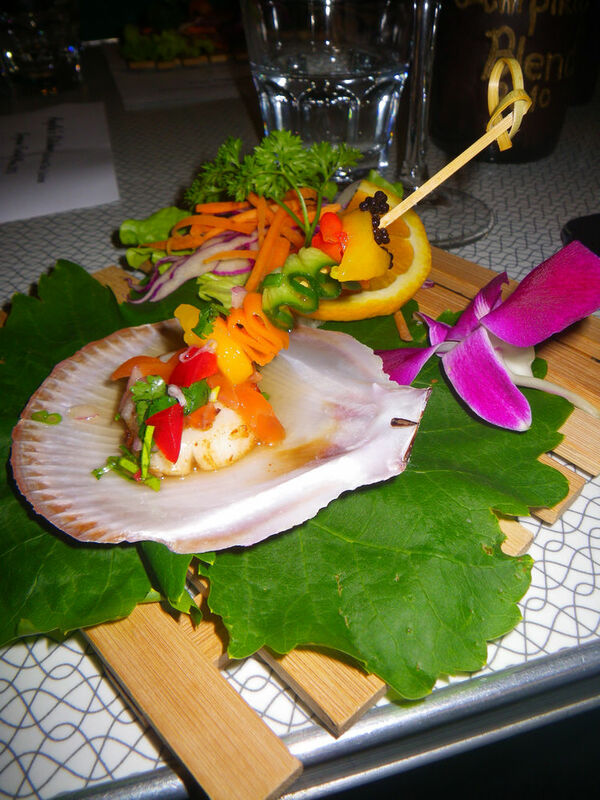 The owners decided to give us a trail of their newly featured Harvey Bay scallops, which is considered as one of the most premium scallops in the world. The flesh of the scallop was huge too! Look how big the scallops is below. The dish was served cold with the restaurant’s own sauces as well as carrot, cucumber, capsicum and fish caviar, which added the extra saltiness to the dish. On palate, it is clean, tasty and very succulent. Unfortunately, as a new item to be featured on the menu, this dish will not be available at this year’s event. The following dishes will, however, all be available for purchase at this year’s event. 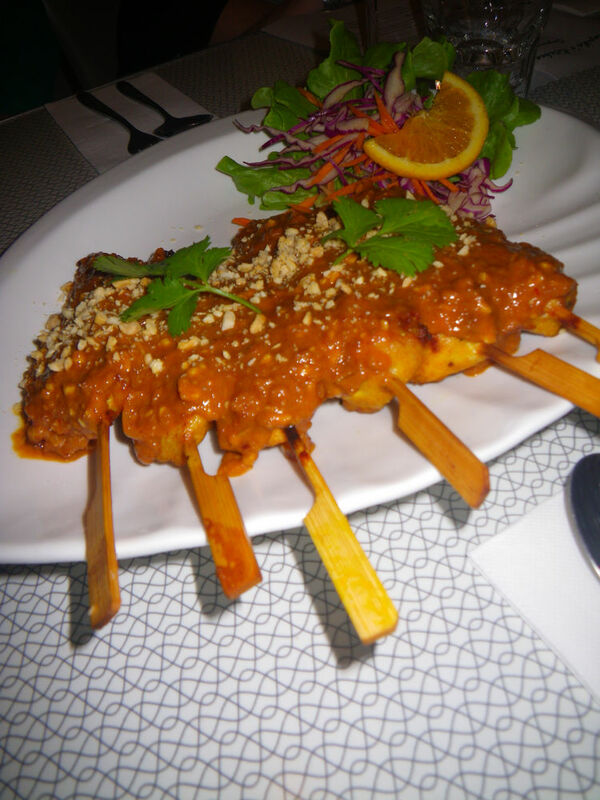 Chicken Satays, skewered chicken breast pieces, marinated with fresh thai herbs and spices. Topped with Ampika’s delicious homemade peanut sauce. I haven’t had a good chicken satay for ages and this one really satisfied me. Once into the mouth, a strong attracting peanut sauce was immediately introduced and it actually hung around in my mouth for a long time. There were hints of hot chili and an obvious SE Asian spicy taste. The best thing of this dish was that the chicken breast was so succulent and moist and one can feel the crunchiness of the chopped peanut, which not only introduced extra layers of flavours, but also enhanced the texture of this dish. The thai herbs helped to clear the palate well. Steamed Thai Dim Sim, minced Murray Valley pork shoulder, mixed with cabbage, onion and Thai herbs, wrapped with wonton pastry, topped with sweet soy sauce and crispy fried shallots. 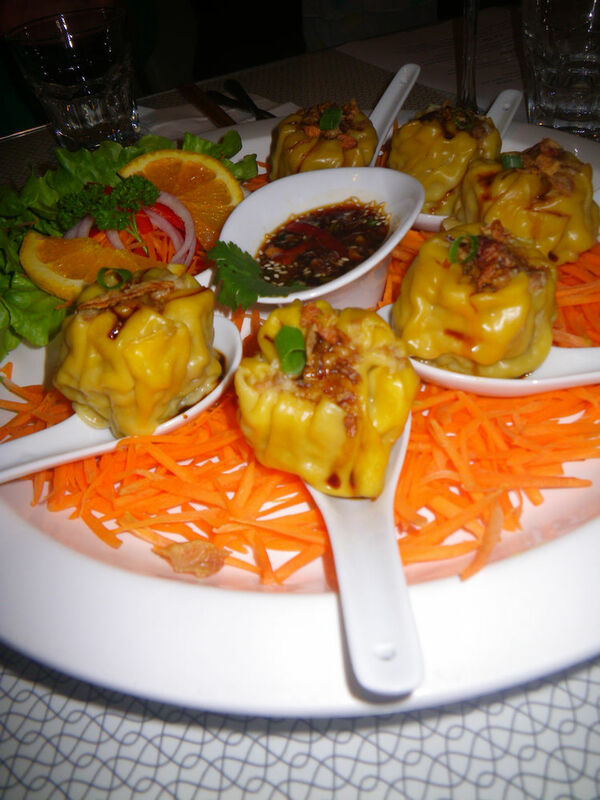 Dim sim is a dish I always love to venture in. These dim sims were made with Murray Valley pork, which are considered as the best pork in Australia by some people. The meat, even after steaming, was tender and juicy and under the influence of the onion and thai herbs, each bite provided me with refreshments and a touch of sweet and slightly spicy taste. The crispy fried shallots helped to improve the flavours as well as provided extra crunchiness to the dim sim. Well done! Thai beef salad, tender limestone beef, barbecued then finely sliced, stirred through a fresh mixed salad, and drizzled with a zesty lemongrass dressing. Garnished with crispy fried shallots and coriander. Richard Gunner has created one of the best beefs in Australia here in limestone coast and this really benefited many restaurants. Ampika’s used the limestone coast beef and barbecued them. Oh, man, with the slices, I was able to easily catch the cooled smokiness and the beautiful texture of the meat. 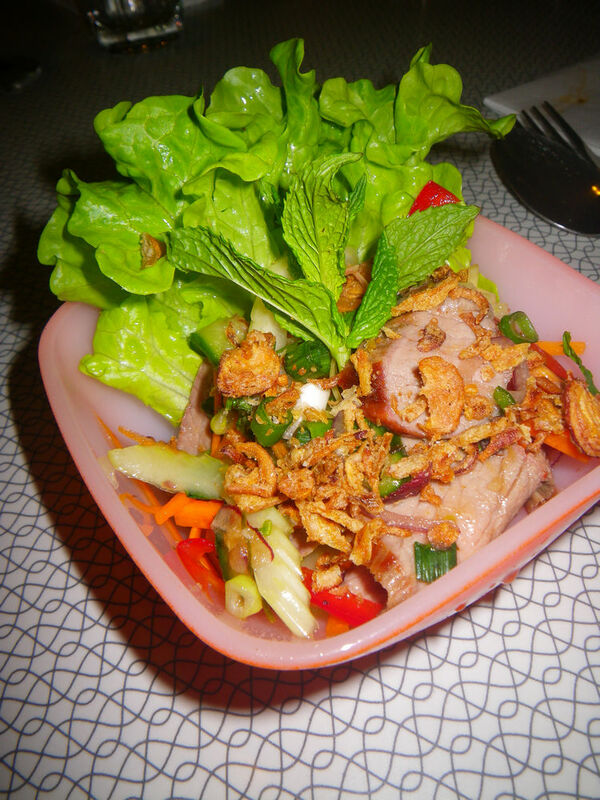 The salad and the dressing provided a lot of refreshment and the coriander made the dish fragrant, both on the nose and the palate. 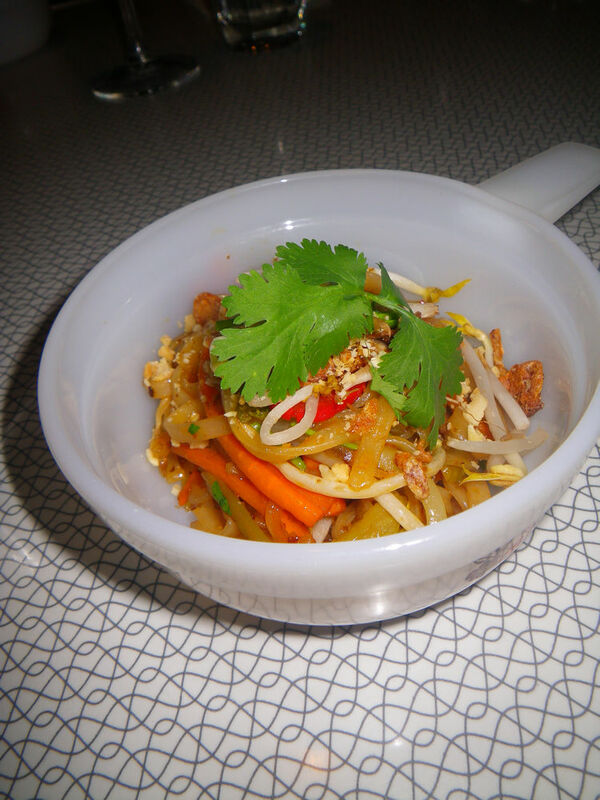 Pad Thai, rice noodles, stir fried with Ampika’s delicious Pad Thai sauce, shallots, capsicum, celery and carrots. Served with ground peanuts, bean sprouts, crispy fried shallots and a wedge of lemon. Pad Thai is probably the most recognised national dish of Thailand. However, to cater for vegetarians, Ampika’s made this dish vegan and gluten free. The taste was even fabulous. We make Pad Thai at home too but for a vegetarian one, the restaurant has definitely gained my support. The rice noodles were well cooked with their house specialty pad thai sauce. The peanut and the shallot made me feeling very enjoyed on this dish. Try it at this year’s Gorgeous festival! The elbow room will also return to this year’s event. 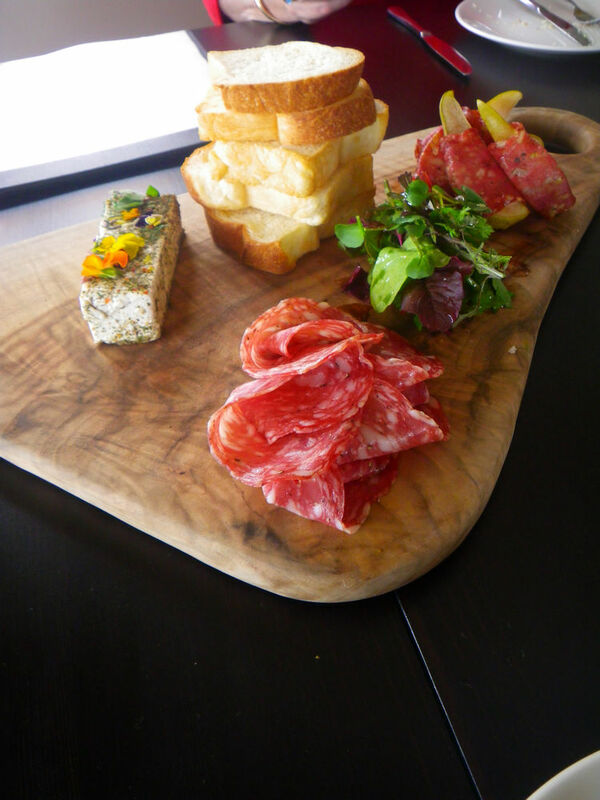 The restaurant’s chef, Nigel Rich, is a pure regional star and is famous throughout South Australia. Being in the industry for over 30 years, Nigel has trained the team well. 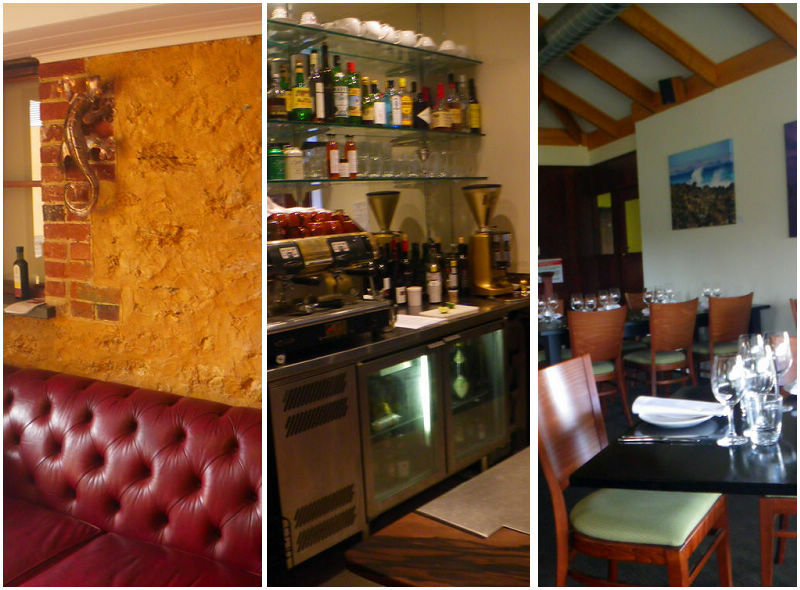 The restaurant features fine dining tables as well as spaces for private functions. The decor of the restaurant is very classic and elegant, giving me a feeling of going back to the colonial times. Although Nigel has not decided the dishes for this year’s Gorgeous festival at the time of our visits, we tasted some of the popular dishes at the restaurant. Let me tell you this, I love this dish. 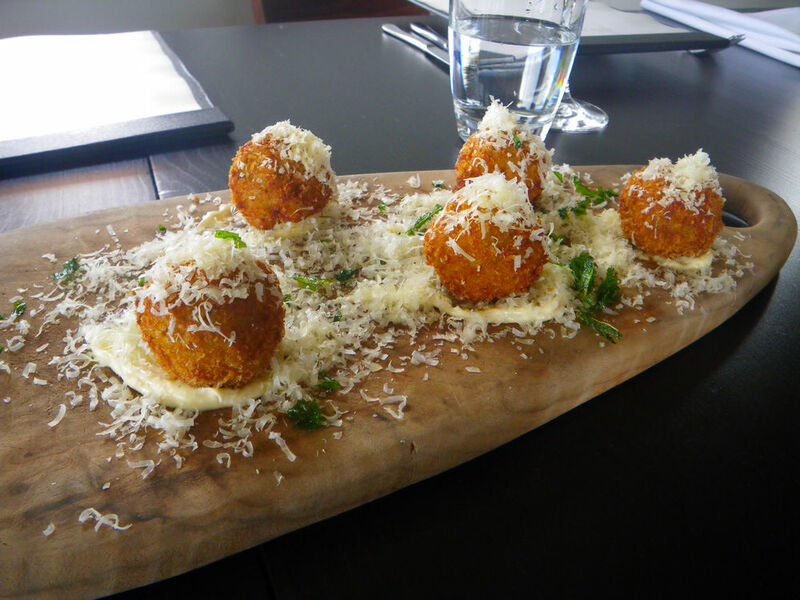 I love arancini balls but this dish brought my memory to a new level. The balls were fried crispy enough while the inside was very moist and juicy. The super fragrant porcini blended well with the pea. The parmesan is a key addition which complemented the rest of the dish so beautifully. A must try! The anipasto platter featured some sopressa, both fresh and grilled with pear as well as woodside cheese monet. This cheese has won numerous awards and you naturally don’t taste much of a goat flavour. I am not a big fan of goat cheese because of the goat flavour. Or maybe I just don’t like goat milk. Anyway, I didn’t taste much of a goat in this cheese and it was so beautiful with balanced sourness and creaminess. Absolutely love it! What a fantastic idea to cook goat shoulder! Goat is my preferred alternative to lamb but it taste much better than lamb in curries. The meat was so tender after being braised in coconut milk. 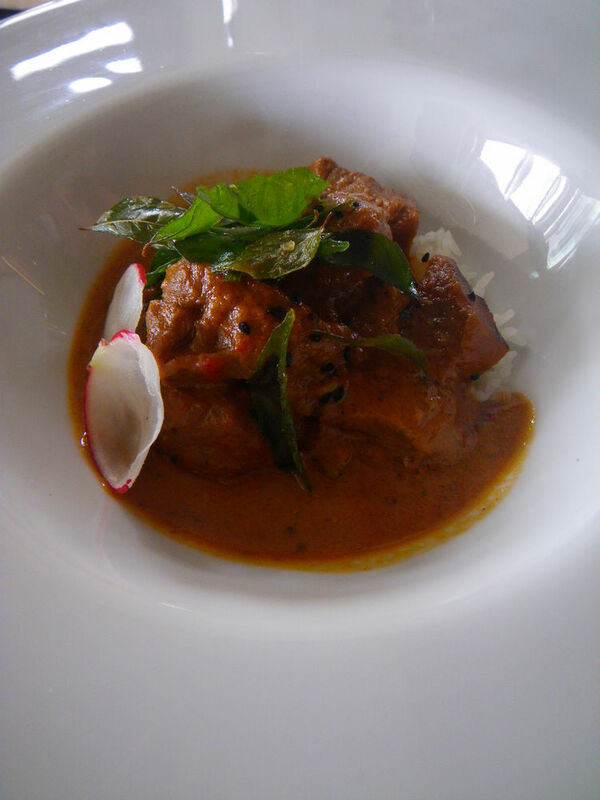 All the strong flavour and aromas of coconut milk diffused efficiently into the meat and made it very very flavourful! The creamy texture of the curry accompanied the meat well to leave a long lasting sensation in the mouth. Delicious and must try! Other food retailers such as Fino are also to be present at this year’s festival. With the time flowing so fast, it is now only 9 days to Gorgeous Festival 2013. If you have not purchased your tickets yet, you can get them here. Enjoy the fantastic music as well as some GORGEOUS food as I did! Fabulous looking Thai food! Wonderfully informative post, thank you Con. It’s hard to find good satay sauce outside of Asia, so I’m looking forward to trying this. Informative post as always.